In 1970, Guinness Superlatives launched the first in a series of books, known as the "Facts and Feats Series", as spin-offs from the popular Guinness Book of Records. The Facts and Feats books were full volumes dedicated to a single topic, which could provide greater depth to their subject matter. The first book published was "Air Facts and Feats", closely followed by similar publications for "Car Facts and Feats" and "Rail Facts and Feats" in 1971. When we started to collect these books, we could not find a comprehensive list of the books in the series (nor could we uncover a list of special editions or reprints). With the help of a fellow collector, our own reviews of Guinness Superlatives book catalogues, and searches of internet-based resources, we believe that the list of books on this page is pretty close to being the definitive list of the books in the Facts and Feats series. Some of the books (particularly the later editions) are included because their edition numbers prove that they are descendents of the original editions. Others may (or may not) be part of the series; where there is uncertainty about a book's inclusion in the series, we have excluded such editions from our current list. Since this is the first list of Facts and Feats books, we may well have missed some editions or impressions, and there may be some publications that we are currently unaware of. If you know of any other editions, please let us know. McCorquodale and Company Limited, London. Jarrold and Sons Limited, Norwich. Notes An updated edition of the 1973 book. As well as changes to some of the records, the title page now has no background picture. W & J Mackay Limited, Chatham, Kent. In September 1978 Sterling Publishing released this edition (ISBN 0-8069-0126-8) in the U.S.A. (right), closely followed in March 1979 by a $6.95 paperback edition (ISBN 0-553-01130-8) from Bantam Books (far right). A special edition of the 1979 Bantam edition was commissioned by Cox Hobbies, Inc. of 4400 West 78th St., Minneapolis, MN 55435. An extra page cross-references Cox model planes with the facts in the book. An order form allowed extra copies to be purchased for $4.75 with a token from any COX product. Butler and Tanner ltd., Frome, Somerset. Adlard & Son Ltd., Letchworth, Herts. Jarrold and Sons Ltd, Norwich. In November 1977, Sterling Publishing released this edition (right) in the U.S.A. The hardback book (ISBN 0-8069-0104-7, 9¾x7¾ inches or 249x197mm) cost $17.95 new. Bemrose and Sons Limited, Derby. Hazell Watson & Viney Ltd., Aylesbury, Bucks. Notes Our copy is signed by Patrick Moore. Butler & Tanner Ltd, Frome. Notes Our copy has a compliments slip from the Sunday Express, which states: "Congratulations! You are one of our lucky winners in our Guinness Book of Great Britain competition". Notes The back of the dust-jacket says, "Who Why Which Whether When Whither Whence Whose What Where? How Fast - How Safe - How? How Far - How High? How Steep - How Cheap?" Notes A different dust-jacket, similar to the D/Js of the next books in the Facts & Feats series. Notes The dust-jacket has the correct ISBN. The copyright page has the ISBN for the 1st edition (0 900424 54 0), which is incorrect. Ebenezer Baylis & Son Ltd, Leicester and London. In October 1977 Sterling Publishing released this edition (ISBN 0-8069-0108-X) in the U.S.A. (right), closely followed in April 1978 by a $6.95 paperback edition (ISBN 0-553-01087-5) from Bantam Books (right). The U.S. edition had an extra page translating some British terms to U.S. English. Notes An extra Ford "Record Breakers" dust-jacket, promoting a holiday competition for Ford dealers in Spring 1982. Redwood Burn Limited, Trowbridge, Wiltshire. This edition was also published by Sterling Publishing in the U.S.A. in 1980, where it was called "Movie facts and feats" (ISBN 0-8069-0204-3). Both a hardback edition (priced at $14.95, right) and a paperback edition (far right) were published. Butler & Tanner Ltd, Frome and London. Butler & Tanner Ltd, Frome, Somerset. Hazell Watson & Viney Ltd., Aylesbury. Redwood Burn Ltd, Trowbridge, Wiltshire. Notes Also known as "The Guinness Book of Golf Facts and Feats"
Notes There is no edition number. Notes Our copy is signed by Beátrice Frei. W & J Mackay Ltd, Chatham, Kent. Jarrold & Sons Ltd, Norwich. Notes The cover says "Olympics Facts + Feats", but the title page says, "Olympic Facts and Feats". There is no edition number. Notes This edition was bound in three different colours (and textures). Copies with brown covers (believed to be later printings) do not have any red printing on the title pages. Notes The book has no edition number, but references the three earlier editions. Notes The book states that it is a 2nd edition, but references the four earlier editions. Butler and Tanner Ltd, Frome, Somerset. The 1st edition was also produced for the U.S. market (priced at $17.95, and described as a "Guinness Superlatives Book"). The book itself was identical to the U.K. edition, but had a different dust-jacket (right). This edition was also produced for the U.S. market by Sterling Publishing in 1976 under the title, "Towers, Bridges and Other Structures" (ISBN 0-8069-0096-2). This book is identical to the standard edition but was specially bound for the Mabey Group of Companies (Chepstow, Monmouthshire) in 1978. 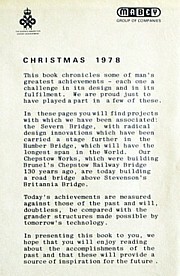 Our copy has a letter from Mabey noting its involvement in the Severn Bridge, the Humber Bridge and the Britannia Road Bridge in Anglesey (right). Sterling Publishing also released this edition in the U.S.A. in 1980 (right). Notes The book is identical to the standard edition, but has a special dust-jacket with details of the military vehicles currently offered by Vickers Defence Systems. In 1976 Sterling Publishing released this edition in the U.S.A. under the title, "Boating Facts and Feats" (ISBN 0-8069-0094-6, price $14.95). The hardback book (with D/J) was slightly larger than the U.K. edition at 242x198mm, but was essentially the same book.